A Serengeti hot air balloon ride is an adventure that can easily be included in your safari itinerary. It can add at least two nights in central Serengeti or Western Corridor Camps (Grumeti River Camp, Kirawira Camp or Mbalageti Camp, etc.). For those in western Serengeti, at 5:00 am Serengeti Balloon Safaris will pick you up from your central Serengeti lodging, or from an organized collection point and transfer you by Land Rover to the launch site near Maasai Kopjes. Here you will meet your pilot, receive a briefing, and watch the inflation of your balloon. You will take off at dawn, rising with the sun, and float in whichever direction the winds of the morning direct. Your pilot can precisely control the altitude of your balloon, and will sometimes fly lower at treetop height, and sometimes even lower, offering a unique perspective over the majestic Serengeti and great photo opportunities of the wildlife below. Other times he will ascend to 300 meters (1,000 ft) or more so you can take in the wonderful panorama of the Serengeti and get an appreciation for the limitless feel of the Serengeti’s boundaries. Duration of the flight is roughly one hour. Once you land, you will be escorted to a table that has been laid out in the highest of standards, including bone china and silver cutlery. Fresh tropical fruits, warm freshly baked bread, and an English traditional breakfast of bacon, sausage, eggs, mushrooms, and tomatoes are served by stewards in customary Swahili dress. You will also be given a glass of sparkling wine to help celebrate this amazing adventure. For those who do not partake in alcoholic beverages, there are, of course, other options available. Around 9:30 am, you will be driven back to central Serengeti lodges or to the organized drop off point in western Serengeti to continue your safari adventure! A: We strongly advise booking in advance with your tour operator to secure your place, since there are only three balloons in the entire Serengeti and this exclusive adventure is frequently fully booked. Q: When is the best time of year for ballooning in the Serengeti? 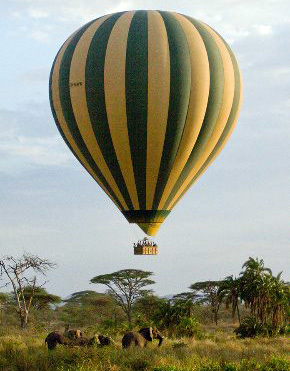 A: The balloon rides go over central Serengeti (Seronera Valley) where there is year-round animal activity. For those who are especially keen on seeing the wildebeest migration from above, big herds of migratory herbivores can be seen in Seronera from late April through the end of June and again in October through December. A: Children under the age of seven (7) are not allowed. There is no upper limit, however passengers must be reasonably mobile, fit to fly, and prepared for an adventure. Balloon passenger weights are calculated at an average of 80 kg (175 lbs). Passengers weighing 50% or more than this (i.e. 120 kgs/265 lbs/19 stone) may be charged for two places.